Whatever else I may say, as a fan or as a critic…the intro is nice. It’s the first time it felt like an updated classic Who intro. I think it’s the theme song that helps but even the visuals match up. I just watched this overkill mash-up of Doctor Who intros over the years (I’m surprised they didn’t work in the theatrical movies) and despite the slight dubstep (which may actually add to the otherworldly feel the theme song should have) and their taking out the Doctor’s face again, it’s closer than any new Who intro. I applaud that. the logo however is still a font with a few lines thrown in, as shown by the other credits, and it still disappoints me. As for the gender change…I think I’ve made my opinion clear. My main problem isn’t the change itself but why it was changed (not to benefit the character so much as make a particular group happy whether it makes sense or not) and if it was ever given a good explanation I haven’t heard about it. I’d even accept “you know how different traits take over for each regeneration…well, sometimes the estrogen levels boost up and there you go”. Simple, easy, works, done. Although I’d have to question if it happens more than once. Yes, I know they’re alien but there are times that excuse works as well as “it’s magic, we don’t have to explain it”. And yes, short research says that the idea was floated around during old Who with even dumber explanations considered. It wouldn’t have worked for me then either, and the reasoning wasn’t as weak as it is now, but I’ve already gone over this enough times. It’s my opinion and we’re both welcome to ours. I should also note that I haven’t watched a lot of new Who. Between cable companies, sickness, and other projects taking up my time I haven’t really kept up as much with the show as I wanted. It also never really had the same charm classic Who had. Both versions had their good and bad stories, and I’m not condemning the quality of a show with an actual budget, but it doesn’t have that same feel. No short serials, the history has been played with far too loosely for my tastes (we already lost science during the classic era, and this show started off as a way to teach kids science and history), and some other issues that may or may not come up in this review. I want to get caught up but if I had the choice I’d rather see all those old shows I missed or haven’t seen since my youth. Now that the full disclosure is done let’s get on to assessing the 13th Doctor since BBC America finally let me watch the second episode. Despite all the misgivings above I tried to come into Jodie Whitaker and Chris Chibnall’s with an open mind. Whatever my concerns are Whitaker has a chance of making a good Doctor. I also really wanted to see what the new TARDIS console room would look like, which is why this has taken so long. 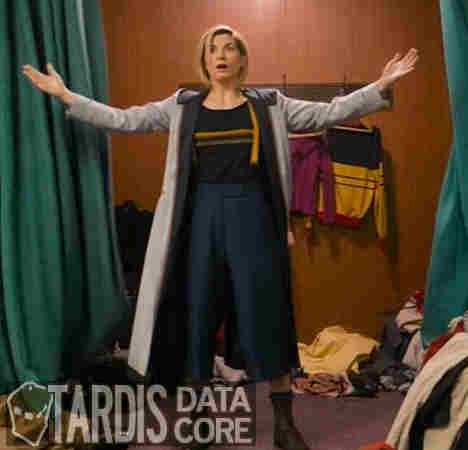 Also note that this is only looking at the first two episodes, “The Girl Who Fell To Earth” and “The Ghost Monument”, because this article is late enough. With that, it’s time to get into this incarnation of The Doctor. One problem I guess you can’t get from watching two episodes is deciding what Chibnall’s theme is for his run. Russel T. Davies focused on making the mundane scary. Steven Moffat (despite creating and overdoing the statue-like Weeping Angels) wanted more of a fairy tale feel. Both tried to be flashy and epic. Chibnall seems to really be pushing his own enemy, the Stenza, while from what I’ve read he’s staying away from the more famous Who threats like the Daleks and Cybermen. I’m not sure how that is going to work out but we’ll see as things go on I guess. As far as concerns I’ve heard from some that Who has been getting more feminist themes in any I saw in these two episodes were subtle and probably closer to traditional feminism than the more extreme modern feminism. Well, if that’s really what you want to go with..
As for Whitaker herself, she certainly seems to have embraced the more manic personas that the new Who incarnations have had, which only maybe Colin Baker came close to. Her outfit…it’s okay. It doesn’t really stand out but it would help her blend into a crowd if that were her style. And I don’t think it is. It’s not that great but not necessarily bad. It’s just kind of plain outside of that rainbow stripe. I can’t say I’m a real fan of her version of the Sonic Screwdriver though. I think the new Who screwdrivers, resembling a screwdriver more or possibly the “magic wand” it was accused of becoming on the classic show (which is why it was abandoned until the TV movie) look better than the classic version but this looks more like a gun, which is odd because this incarnation is very anti-gun and anti-killing of any kind. Even 11 didn’t bother much with guns but didn’t get mad at others for using them. Even when someone is defending themselves or trying to save the world she gets really mad based on these two episodes and some minor research. Getting back to the screwdriver, it just doesn’t impress me all that much. Then we have her three Companions, Ryan’s actor doesn’t have a lot of energy. Even his normal speaking voice sounds like a whisper. I don’t know if they’re going to try to romantically pair him with Yaz, but I kind of hope not. A man and a woman can be just friends. His big arc seems to be accepting his stepgrandfather, but he also has a coordination disorder that he has to learn to overcome. Each of them has a different family issue. Graham lost his wife, Ryan’s grandmother, in the first episode (another interracial romance ended in new Who, this time by noble death…why do they even bother at this point?) and she had helped him through his cancer. Yaz has a hard to get along with family and she’s a police officer. I want to see the latter come into play at some point. I think she’s the first canon police officer on the show but I could be wrong. Yaz and Graham seem like good characters while Ryan I’m not too sure about just now. I hope he gets better. It seems they’re trying to have a representatives of the entire racial make-up of England, like they’re the Power Rangers or something. That doesn’t make them bad characters. One review noted that there are too many Companions for a new Doctor, but I’m guessing the reviewer meant “to introduce a new Doctor alongside” because Peter Davidson started with three Companions as well. Then there’s the Stenza, the race Chibnall is trying to push into Who lore. We know they’re warriors who enslave others and not much else at the moment. They may have potential or they may end up as cut rate Klingons filling a role the Sontarans did better. And finally there’s the new TARDIS. I am so underwhelmed with the new TARDIS control room. The TARDIS wiki (fitting for this paragraph) refers to it as the Crystal Console, due to that large crystal in the center. I actually do like that, although it’s bigger than I would have done, and in my own design (it’s just in my head so I can’t show it to you) that is what replaces that large tube they’ve had since the TV Movie. But I can’t say I care for it otherwise. I don’t expect the classic look to come back by now but my favorite of the new rooms is the second Matt Smith console, which the wiki calls the “Neon” console room. This brings back all the flippy switches and dials of the first two new Who consoles which I never particularly liked, those columns from the Victorian TARDIS of the TV movie, and just doesn’t have the same feel as the Neon room. I’m not expecting the classic console back and my tie to it comes mostly from nostalgia but this doesn’t work for me either. It’s not bad but not that great, just okay. And that’s my ultimate assessment thus far of this incarnation: not good, not bad, just okay but with potential. Whitaker is an okay Doctor and may get better as she finds her Doctor. The TARDIS is okay but I don’t see it growing on me. The Sonic Screwdriver is okay and I don’t expect that to grown on me either. The companions are okay but also have potential. The new threat is okay but has potential. Not good, not bad, just okay with potential. There’s potential but it doesn’t quite reach it. I’m not really drawn to watching this new version. I don’t think it’s bad but it doesn’t really excite me either. Posted by ShadowWing Tronix on November 7, 2018 in Television Spotlight and tagged Doctor Who, Graham O'Brien, Ryan Sinclair, TARDIS, The 13th Doctor, The Thirteenth Doctor, Yasmin Khan (Yaz). Ok, ok, ok. Maybe this new Doctor will dazzle you more as time goes on. I’m so out of the loop with any of these 21st century Doctors so I can’t really comment intelligently on any of this. Like you, I’m definitely an old school Doctor Who fan of the classics from the 1960s to the 1990s (I’m including the 1996 television movie in this classic era). I am curious to see what these Stenza look like though. It’s refreshing to have new enemies portrayed on Doctor Who, however, the classic enemies should be included too (my favorites being the Silurians, Sea Devils, Ice Warriors, the Master, and the Rani). The Doctor has been an old man, middle aged men, and young men. So now the Doctor is a young woman. With regeneration, anything is possible. As long as the writers don’t try to have the Doctor regenerate as a cat! Meow! If you like watching the classic Doctor Who episodes, does your local library have Doctor Who DVDs that can be borrowed? My local library has an extensive collection of classic Doctor Who DVDs. That’s how I was able to see a large number of classic episodes from the first 6 Doctors. And of course, I’ve watched the classics from my own personal collection of Doctor Who DVDs. If your local library or a library in a town close to you has these old school Doctor Who DVDs, you should definitely check them out. For instance, that’s how I was able to watch the incredibly awesome Doctor Who DVD set during the French Revolution (William Hartnell) due to my library having these.